A compassionate and optimistic roadmap, based on the science behind great health. 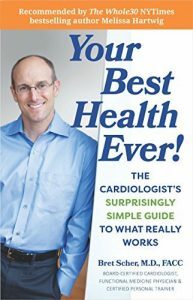 Developed by a board-certified preventive cardiologist, this surprisingly simple guide puts you back in charge of your own health – without a lifetime of prescription drugs or extreme lifestyle changes. Easy-to-follow explanations make sense of the endless flood of studies, headlines and “expert advice” and give you straightforward weekly plans that won’t overwhelm you. Imagine your best health ever – and make it happen! Dr. Scher demystifies the important science behind healthy lifestyles. He debunks myths you’ve heard even the “experts” repeat, and shows you how to navigate healthcare and food industry propaganda to set yourself up for success. Overwhelmed by ever-changing health advice? Ready for more than crazy fads or prescriptions? Your instincts are right on. Great health ISN’T as hard as society tells us, and you CAN do better than prescription drugs! You CAN take charge of your health–starting now. Are you ready for a simple, back-to-fundamentals approach that actually works? Do you want to take charge of your relationship with your healthcare providers? Built around the six building blocks of great health, simple weekly action plans tackle everything from eating well to overcoming sleep and stress, backed up with helpful tools like checklists, power tips, a problem-solving guide, and more. You’ll have the confidence–and the knowledge–to start your journey to your best health ever!